I used to complain a lot and then I channelled that energy into baking. Now instead of me grumbling, I hear the various tummies in my house making that noise! When I was in high school, back in the (cough cough) 80s, I was in the group that didn't belong with anyone else. We didn't listen to the top 40 of the day, we didn't go see Footloose or Dirty Dancing. We didn't even wear our collars outside of our pullovers. We dressed how we wanted, listened to what was really alternative - like having to go downtown to fringe record shops to buy stuff we had never heard from groups we had only read about and discovered real music – and we all became real friends for life. None of us stayed in our hometown to marry our high school sweethearts. We lived our lives the way we wanted. We all stayed in touch peripherally. Someone always knew what one of the others was doing. I had known that my friend Mark McAlpine had moved to Guelph, Ontario and became a tattoo and piercing artist because he was living near other mutual friends. And then Facebook came along. Being the technologically savvy bunch we were, we all friended each other back in the days when Facebook friends were actual friends. A few years back Mark and his wife Shelley announced they had started to keep bees, and they had produced a small batch of honey which they were willing to sell to friends. Being someone who has always been supportive of local farmers, good food, and my friends, I bought a 1kg jar from Mark to try it out. That jar held some of the best honey I had ever tasted in my life. I was used to going to the farmer’s markets and farm markets in my local area and buying craft honey there. I was used to the difference between store-bought honey and fresh from the hive honey. But when I tasted Mark and Shelley’s honey, I could taste the warmth of the sun in every drop. This was honey that had curative powers for sore throats, flu bugs, and honey that brought out the best in every recipe I used it for. Mark and Shelley branded their business as Backyard Bee Works, and have been selling honey in the Guelph area ever since. They have a network of hives in St. Patrick’s Ward, or The Ward, in Guelph from which the honey is harvested and packaged. I recently did an interview with them for the May issue of Eatins Canada, and asked them to talk about what led them to starting their own backyard hives, the expansion of the network, and the state of the honey business and honey bees in Canada, especially given the winter we just went through in Southern Ontario. Mark: I had a good friend who worked at the University of Guelph's Honeybee labs and I'd ask him questions about bees. In 2007, with his encouragement, I took a weekend beginner's beekeeping course at the University, and purchased our first bees from a local beekeeper early that same summer. I set up two hives in our backyard. I don't know that Shelley was too happy about the idea of several thousand bees in our backyard, but it was soon apparent that the hives and bees weren't going to interfere with our normal use of the yard. Its not like all the bees are just hanging out in your backyard, they’re flying off all over the city gathering nectar, so unless you stood right by the hives you’d hardly notice them. Shelley: I was absolutely terrified to have bees in our backyard. No joke! I didn't have a lot of knowledge and assumed they would be like the Seinfeld Movie "Bee Movie". I wasn't interested to have thousands of angry insects who thought we were stealing their honey. I overcame my ignorance by taking a bee keeping course at the university of Guelph. Taking the beekeeping course was a great way to get comfortable with the idea of having bees in our yard. Why the decision to expand to multiple hives? Not just in your yard but in yards across St. Patrick's Ward? At that point were you interested in selling the honey or were you trying to experiment with nectar flavours, bee output, etc.? Mark: Healthy hives with a good Queen will eventually hit a point where quite naturally the hive is ready to swarm. Basically what happens is that within the hive, all the signals indicate that the hive is doing well, food is plentiful and the current hive is close to being full up with bees, honey and pollen, so it’s time to split the colony and spread. The queen will lay a successor, and then leave the hive taking roughly half the bees and honey stores with her. They establish a new colony and the newly hatched queen takes over the existing hive. As a beekeeper and a good neigbour, we don’t want the bees to swarm and become a nuisance to those living around us, so there are ways to split a healthy hive into two colonies that fulfills the swarm instinct of the bees and allows you to expand the number of hives you have. With healthy colonies this can happen quite often, so very quickly you can go from two hives to four to 8 to how ever many you can handle. We also had friends in the area who were interested in supporting bee populations but were not wanting to keep their own hives. We were able to put new hives in yards around our neighbourhood, St Patricks Ward (or simply The Ward if you live in Guelph,) which has a direct benefit on local gardens, fruit trees, wild flowers, and vegetable patches, and allowed us to expand our hives without overwhelming our own backyard. As far as the honey goes, even with only a couple of hives we soon had more honey then we’d ever be able to make personal use of, so we started selling to friends and family. We have some extremely loyal customers, and each year we quickly sell out. One of the most obvious differences between your honey and the mass-produced honeys people find in supermarkets is that your product is made in small batches and is unpasteurized. 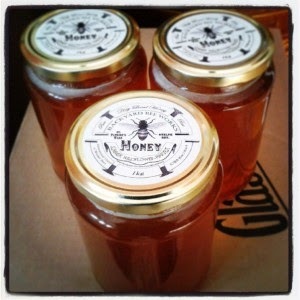 Many of our readers may have seen craft honey available at farmer's markets or roadside produce shops as well. Can you describe the differences in process and flavour between your honey with its wildflower origins versus a single-flower honey that is found at places like the farmer's markets? Shelley: As city bees they have free reign to harvest whatever various types of pollen they need to feed their babies (the cutest thing ever is watching a baby bee nibble free from her cell!) or gather a particular type of nectar to help the health of a hive. They aren't thinking about taste, they are concerned about the hive's well being. Urban honey bees, like all bees, travel about several kilometers from their hive to gather nectar and pollen. If the only thing around is clover, that is the honey you will get. It is about personal preference! By all means, please, please support your local bee keeper! They are gathering great honey. Be wary of large multinational corporations who purchase honey from all over the world. In a nut shell, buy local honey! Mark: On average, a worker bee will live around 40 days. She’ll go through a number of jobs as she gets older, from nurse to guard to pollen and nectar gatherer before she eventually dies. Over winter these same workers will live for several months until the spring weather hits. A Queen bee can live for many years. We've had one of our Queens live for nearly 5 years before the hive replaced her. As far as distance goes, it’s been well documented that bees can travel 6km or more in search of pollen or nectar, and 3km is a common average given. That means our bees have likely visited every corner of the City of Guelph, and even well beyond they city limits. According to the Canadian Honey Council, honey bees need to visit around two million flowers and fly 80,000 km just to make one pound of honey. With fruits and vegetables, harvests vary from year to year. 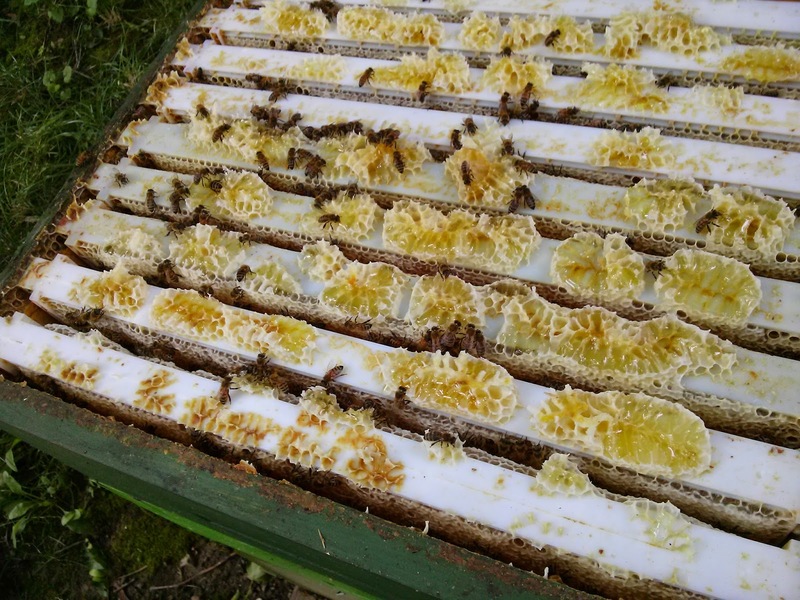 What are some of the annual perils that the hive can encounter that affects honey production? Mark: There’s so many things that can affect the health of a hive, or how much honey is gathered over a season. Long, hot and dry summers can mean there’s no nectar to gather, early spring frost can kill blooming plants and mean that there’s no food for bees after a long winter. Or, like this current winter with cold weather that goes on and on, the bees can often use up their winter food supply and end up starving before the spring arrives. We’ve lost way more hives this year because of this exact problem, compared to other years. It’s a terrible thing to open a hive in the spring and see that the bees have run out of food and died, despite everything you did to prepare the hive for winter. That’s without even getting into the number of pests and diseases that target honey bees and their hives. Bees are in a precarious situation, and vulnerable to so much. In North America, wild honeybees colonies basically no longer exist — there are lots of other wild native bees out there still, but specifically honeybees in the wild have pretty much died out from the various diseases that kill a hive when left untreated. If you see a honeybee on a flower in a field, it’s overwhelmingly likely that bee came from a beekeeper’s yard. Even bees that swarm from a “kept” hive and end up making their home in a tree or log in nature don’t tend to live long. Without beekeepers, we wouldn't have bees pollinating our vegetable, flowers, fruit trees at all. Shelley: The beekeeping community is an important one, and we make sure to reach out to other bee keepers as well as to continue to rely on professionals like the amazing Ontario Beekeeping Association’s Tech Transfer Team here in Guelph, to acess information and resources that help keep our honey bees healthy. Ontario, and Guelph in particular has a dedicated group of professionals and academics who have dedicated there lives to keep bees happy and healthy, so we’re extremely fortunate to be able to access that. Mark: I got involved in beekeeping because of that exact sense of community you mentioned. I had a couple of friends who were extremely generous with their time, especially when we first started out and were terrified of making any wrong move with our hives. They’d come by, help with inspections, reassure us that we were on the right track — they were just so helpful beyond the call of duty, and it’s the example they set for us that we try and follow. As others around us take an interest in having hives or learning more about how to help honeybees, we've tried to be the folks who will come by and lend a hand, check out the hives with them, help them extract honey at the end of season — all the stuff we benefited from when we first started out. I think that’s what makes our situation so special — it’s slow, small scale, and community oriented. Some friends have been inspired to have hives of their own, and others go out of their way to buy our honey as a way of supporting our efforts. In addition to honey, what other bee-related products do you make? Shelley: Mark has made some awesome tattoo balm and this year we are getting into lip balm, I'm an addict, so I better start making my own. Every coat pocket I own has a least one tube! Mark: We've collected a tonne of pure beeswax over the last number of years and I've had friends buy blocks of it to use in art projects, and as Shelley mentioned I've developed our own line of tattoo aftercare balm that’s been very popular in town. On a personal level, I use our honey when making mustards, and have been toying with the idea of making a variety of honey mustards to sell as well, but the honey is what most folks know us for, which is fine by me! All pictures by Mark and Shelley McAlpine. Food is meant to be shared. So are our experiences, good, bad, or otherwise.